NASA just captured a gorgeous image of a place where new stars are born. NASA’s Spitzer Space Telescope captured a “space butterfly” nebula that appears to reveal how the circle of life of stars happens. Such an image has been snapped using NASA’s Spitzer Space Telescope, a remarkably detailed image considering the nebula to be some 1,400 light years away from Earth. The Space Butterfly as NASA calls it is a pair of massive gas clouds. Called the Westerhout 40 (W40), the red “space butterfly” is actually a nebula that gives a more natural understanding of how stars form from the very destruction that helps them create. The nebula is a cloud of gas and dust in space where stars are born. 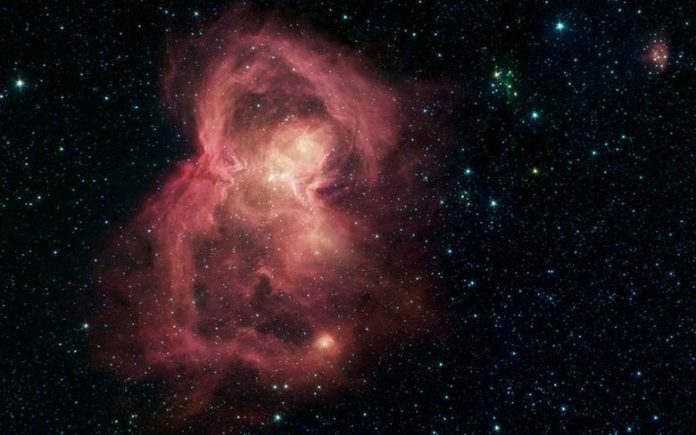 What appears in the image as two butterfly wings are in reality bubbles of hot, interstellar gas blowing from the hottest to most massive stars in that region. The image provides intricate details as scientist have already started cataloging stars for possible alien exploration. How are stars born? As NASA explains, W40 shows stars are formed from the destruction of clouds that prompts their genesis. These condensed gases have a considerable force of gravity, which pulls massive clouds of dust and gas in space and pulls objects together to form dense clumps. When clumps achieve a desired critical density that is required it results in the formation of stars at their core. Bubbles like the W40 are formed when radiation and wind from humongous stars combine with the residuum of a star’s explosion. However, as NASA spots more of these objects, the journey into interstellar space, which refers to the space between stars, has also started. There are instances when at times such processes would emit gas and dust that clumped up into dense formations. This would either prevent or reduce the creation of new stars. NASA has already sent its Voyager 1 and Voyager 2 probes into interstellar space, and it might not be too far to send any humans into it. NASA claims that scientists and engineers are already researching on this and have started developing expertise along with proper technologies that might help us get there one day.